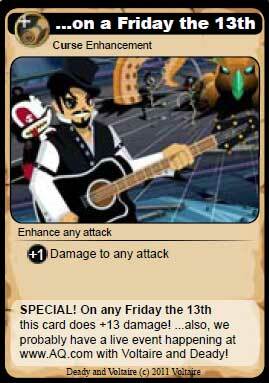 Hi there, Epic Duelists, it’s nearly Friday the 13th, the time of year when the AE MMOs have special visits from mustachioed gentlemen. Usually of the top hat wearing variety. But just because we don’t have a Big Musical Guest and our newest Mustachioed Gentleman doesn't wear a hat, doesn’t mean that our players have to be unfortunate this Friday the 13th. We’ve implemented a new system that allows us to to track how changes we make affect overall balance on the live servers- we call it “The Balance Tracker”. Obviously the Creative Team did not come up with that name. What this means for you is that we’ll be able to track who's beating who at each level, which will show empirically which class is "superior" at each level. This will give us easy to read data we can use to make adjustments to class balance a lot quicker and improve balance in modes like 2v2 or Juggernaut which are difficult to balance on the developer server. The longer this system runs, the more data we'll receive, the better decisions regarding balance we'll be able to make. We are also making an adjustment to Hybrid Armor - many players have complained that the skill is useless since in order to reap the full benefit of the skill, players must waste a turn switching armor type. Hybrid Armor will now passively endow both defense and resistance, with the defensive skill split between the two. For example, if your Hybrid Armor gave you +12 defense OR resistance at level 33, it will now give you +6 defense AND +6 resistance! This is intended to be neither a buff nor a nerf, but simply an adjustment to how the skill works. Players will now be able to challenge the new War Bosses, King Alaric and Commander Edgar Boothe. For this release, you will be limited by alignment for challenge purposes, and both Alydriah and Aldhagrimm will have a special alignment-specific mission for you involving these Juggernauts. Both Boothe and Alaric are 2v1 Bosses, so you’ll have to team up with an ally to defeat them. Both you and your ally must belong to the same alignment at this time. During the Aftermath and forward, players will be able to challenge Boothe and Alaric regardless of alignment. Defeating either one of them will reward you with 200 War Points, plus a chance to receive a bomb or perfect gem! Speaking of achievements, we’ve had an issue with players switching sides to get both the “Krampus Slayer” and “Legion Bane” achievements, leading to some players believing we were rewarding disloyalty and punishing founders of long-standing factions. I can assure you that this was never the intent- we’d intended to give each side a unique experience in the Conflict for Frysteland. To reinforce the concept of alignment loyalty, we are considering a couple options, including removing one achievement or merging the two achievements in question into one “disachievement” worth 0 rating points and marking that player as a traitor. We don’t want to simply punish turncoats, and we do wish to reward the players who have remained loyal to their alignment and factions. We’re still figuring out the best way to go about that now and going forward for future events in which each alignment offers a unique experience. The Frysteland Conflict will soon be over! 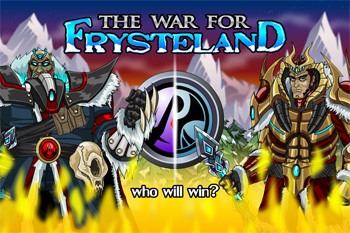 On January 27th 2012 the Frysteland War will be over, and the winning alignment announced. As I said, your actions determine the fate of Frysteland and the Krampus people- as well as the baby Yetis! I’ve already been hard at work at figuring out what’s happening next, so give it your all, people! I do want to thank you guys for participating and pointing out areas for improvement. This was the first time we did something like this in-game and there are bound to be places where we could have played things differently. Thank you. 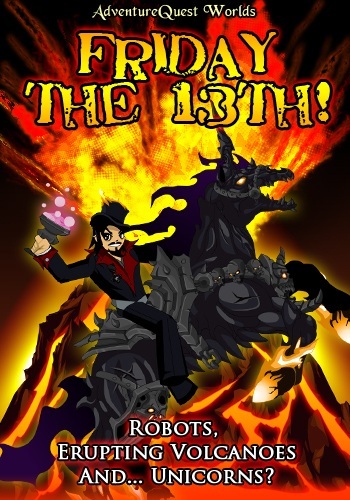 In AdventureQuest Worlds this Friday at When It’s Ready O’Clock, Goth rocker and familiar face to ArtixEntertainment Voltaire will be once again appearing in a Friday the 13th event promoting his latest album Riding a Black Unicorn Down the Side of An Erupting Volcano While We Drink From a Chalice Filled With The Laughter of Small Children. My obsession with Voltaire and Deady is well-documented (followers of me on Twitter have seen my hand-knitted Deady Bear, and I have two signed copies of the album (one of which Deady also signed, because he will not eat me) so you might see me in-game!